I loved this author's first book, Orphan Train, and couldn't wait to read her new book which published in late February. A Piece of the World was different but as good as her first book. This was a beautifully written book about someone who spent their entire life in one small piece of the world but left a legacy that has been seen all over the world. Christina Olson was born and lived her entire life in a farmhouse in Cushing, Maine. When she was young, the house was full of her brothers, her parents and her grandmother. It was a working farm and there were always chores to be done and mischief to get into with her brothers. When she was about 10, she got very sick and was never able to walk well again. Even though her disease was never diagnosed in the book, it appeared to be some type of muscular weakness that progressively got worse. She loved school but when she got to 8th grade, her parents decided that it was time for her to stay home and help with the house. With no electricity or running water, her work was difficult and tedious. The author describes all that she had to go through to keep the farm running. Her mother was of little help and her father thought that it was her job to do the work. All of her brothers except one found life outside the farm and moved away. When Christina was much older and only she and her brother remained at the farmhouse, which was very run down. Andrew Wyeth, the famous American painter came to town to visit friends and decided that he wanted to paint at the farm house. He spent the next 20+ summers painting in Cushing Maine and the farmhouse and Christine become his muse. 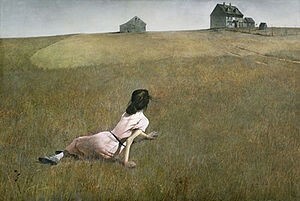 She becomes his model for his famous painting "Christina's World". 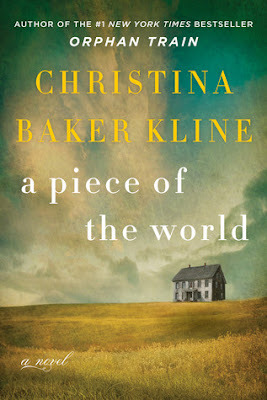 A Piece of the World is so well written and tells a story about someone that I never knew existed despite the fact that I have seen the painting. Christina's life was centered on her family and her farmhouse and her life of chores despite the constant pain she was in. She was a wonderful well-written character and one that I won't soon forget. Susan Roberts was born and raised in Michigan but after college decided that she wanted to live somewhere much warmer. Susan lives in North Carolina when she isn't traveling. She and her husband enjoy traveling, gardening and spending time with their grandson. Susan reads almost anything (and the piles of books in her house prove that) but her favorite genres are Southern fiction, women's fiction and thrillers. Susan is a top 1% Goodreads Reviewer. You can connect with Susan on Facebook.